The Compact 33 was released in two formats, the Compact 33 single and the Compact 33 double. The Compact 33 double generally contains four tracks whereas the single contains two tracks like their 45 RPM counterpart. The RCA LPC prefix series, which likely means (by my own assertion) Long-Play Compact 33, is an example of the Compact 33 double format. Compact 33s are 7 inches in size and resemble the 45 RPM except that the hole is LP size. This LPC series do not have a 45 RPM counterpart and are unique. Some of these titles are difficult to obtain. This compilation of the Double Compact 33 Records is based on eBay auctions, price guides, and many search engines. 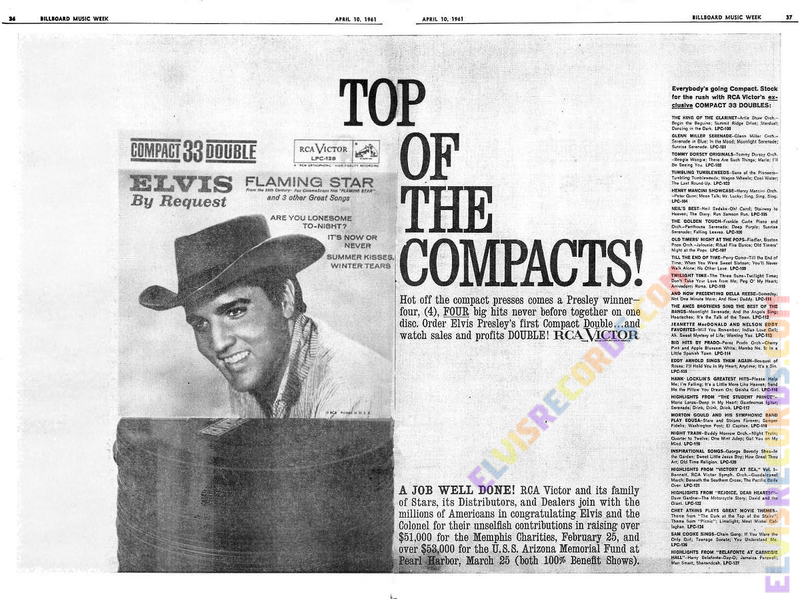 Billboard Magazine, April 10, 1961 featured this RCA Victor two page advertisement titled "Top of the Compacts! on pages 36 and 37. Along with a picture featuring Elvis Presley's Elvis By Request, there is a comprehensive listing of all titles to date on the far right side. 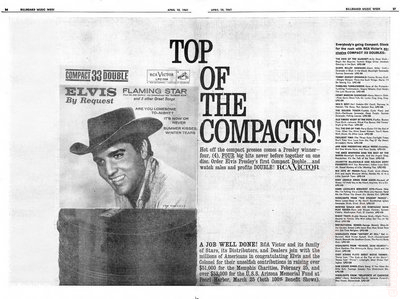 The second advertisement is from Billboard Magazine, June 12, 1961, page 29. 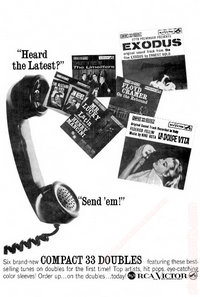 It features six of RCA Victor's newest releases. Read more about The Rise and Fall of the Compact 33 Single.